In general, it is a common feature of all analysis methods that when atoms or ions of a different species but with similar properties are also present, i.e. coexist with the atoms or ions of interest, they interfere with measurement. This is also true of analysis using ion selective electrodes (which we refer to as the ion electrode method), so that if ions similar to the target ions are present, they will—to a greater or lesser extent—affect measurement. When considered in contrast to the target ions, these ions are known as interfering ions. The intensity of the interference produced by an ion species is expressed by the selectivity coefficient (or by the maximum allowable coexistence factor, this roughly corresponding to the reciprocal of the selectivity coefficient). The “What are Ion electrodes?” section states that the pH-sensitive glass electrode can be regarded as a hydrogen ion (H+) electrode. pH-sensitive glass electrodes are largely not affected by coexisting ions, but the “Measurement for strongly acidic/basic aqueous solution” section in “Measurement of pH” mentions that measurements of samples with a pH over 12 suffer from a certain level of error (called alkaline error). Alkaline error indicates that, in addition to responding to H+ ions, pH-sensitive glass electrodes are also affected to some degree by alkaline metal ions (such as Na+ and K+). Do you recall the periodical table? Each column contains elements with similar properties. For example, Li, Na, and K etc. are the alkaline metals, which tend to form monovalent cations; Mg and Ca etc. are the alkaline-earth metals, which tend to form divalent cations; and F, Cl, Br, and I etc. are the halogens, which tend to form monovalent anions. 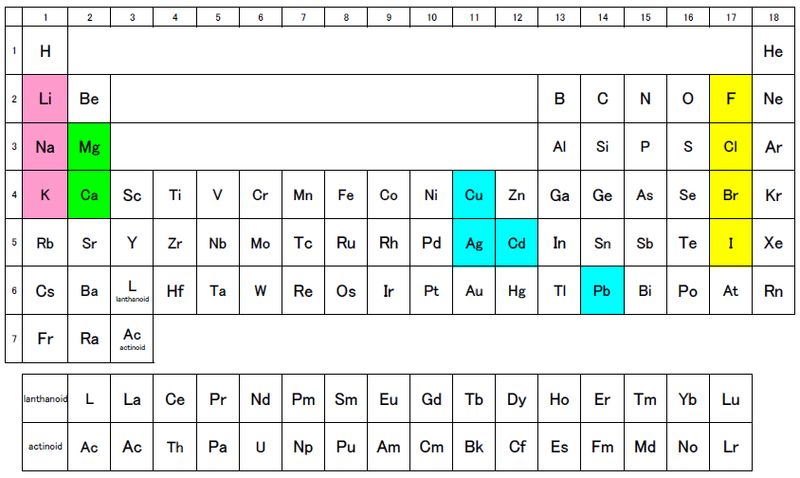 In addition, the elements Cu, Ag, Cd, and Pb, which tend to form monovalent and divalent cations, are aligned relatively close to each other both vertically and horizontally within the table. When using the ion electrode method, care needs to be taken with regard to mutual interference within each of these groups. In addition, the effects of coexisting ions can be predicted to some extent from the response membrane material, that is to say, the reactivity of the response membrane material to the coexisting ions. For example, a solid-state membrane electrode can be seriously affected by coexisting ions that form insoluble compounds or complex salts with the material of its response membrane; and a liquid membrane electrode can be affected by coexisting ions that form ionic associates with the components in its response membrane. where aK+ is the potassium ion concentration, and ax is the interfering ion concentration. The smaller the value of K, the less the interference. The selectivity coefficients of typical interfering ions are listed in the table below. Please note that the selectivity coefficient varies depending on potassium ion concentration. The values in the table are for 10-3mol/L K+. The larger the potassium ion concentration, the less the interference. where ai represents the activity of an ion other than the target ion denoted by i, and is a value indicating the impact that ion B has on the sensor used to measure ion A. The smaller this value, the better the selectivity with respect to the target ion. Hence, in practice, the ratio of target ion to interfering ion concentration is very important. Higher concentrations of target ions result in the interfering ions having a smaller effect, and conversely, lower concentrations result in them having a larger effect. An ion selective electrode has its own operable pH range. This range is itself determined by the two following ranges: (1) the range in which the ion electrode is not affected by hydrogen ions H+ or hydroxyl-ions OH-, and (2) the range in which the target ions can exist as ions. For example, to a greater or lesser extent, metal ions tend to form hydroxides, not free ions, in the alkaline region. In practice, the pH range in which an ion electrode maintains a constant electromotive force is measured by changing the pH of a target ion reference solution of fixed concentration (such as 10-3mol/L or 10-4mol/L) from acidic to alkaline. These measured pH ranges are stated in the relevant catalogs. Our ion selective electrode catalogs show as much information as possible regarding the selectivity coefficients and maximum allowable coexistence factors of interfering ions.